Successfully Added 1080P Car Camera - 170 Degree FOV, Parking Camera, Motion Detection, G-Sensor, Loop Recording, Time Stamp to your Shopping Cart. Wide angle 170 degre field of view captures the full road ahead. 4.0 inch LCD screen offers roadside playback that can exonerate you in an instant. You can't go wrong with this dual camera dash cam and backup camera setup. With 1080P recording at 30 frames per second it really hits the mark with image quality. This makes it easy to pick out number plates and other identifying features clearly. A wide 170 degree viewing angle on the front camera hits the sweet spot and ensures nothing goes undetected. Automatic startup and seamless loop recording means this dash camera will reliably captures everything happening in front of you. The large 4.0 inch display and easy to navigate menu ensure great usability and give the ability to play back the video on the spot. A valuable feature that can immediately exonerate you should you be involved in incident on the roads. A rear parking camera is a fantastic extra feature that makes getting into and out of those tight parking spaces super easy. Equipped with G-Sensor this car DVR will automatically lock the current video recording should it detect erratic or sudden movement. This prevents important videos that may be used in evidence from being recorded over with later events. Using H.264 video encoding allows for loss les compression of each recording so it takes p less memory space. 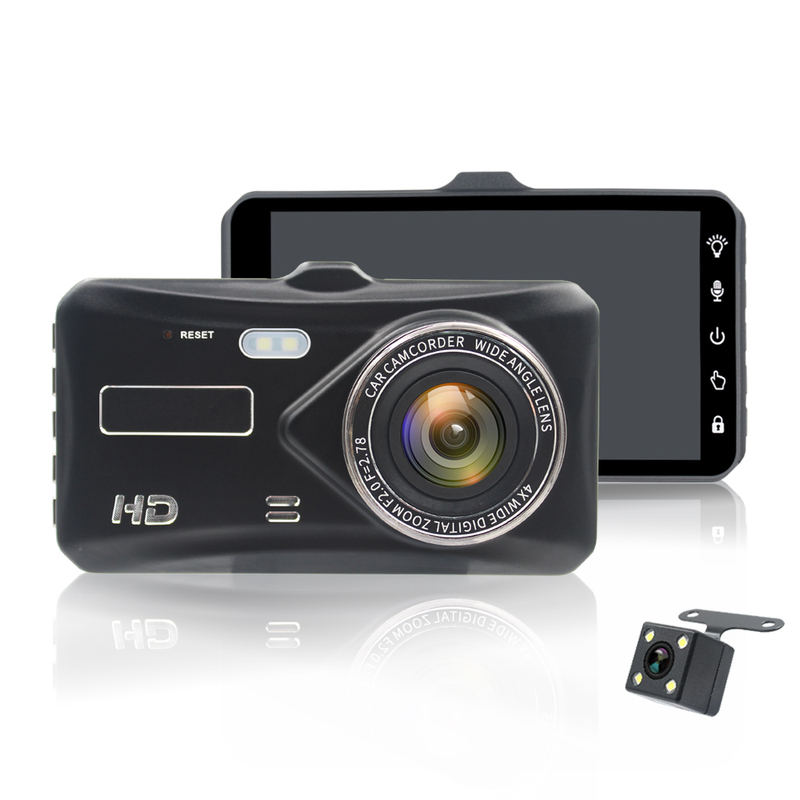 With 32GB micro SD card support there is enough memory capacity for all your dash cam needs. The included suction mount makes it easy to setup and adjust the front facing dash camera while the rear parking camera has a small bracket for easy installation. Coming at a low price and with excellent features this car dash cam and backup camera will bring extra security when on the road. This car dash camera comes with 12 months warranty, brought to you by the leader in electronic devices as well as wholesale dash cameras and parking cameras..
Photo reslution: 1M/2M/5M/8M/10M (true photo pixels are 200W). Arabic: - سيارة دفر - Chinese Simplified: - 车载硬盘录像机 - Czech: - Auto DVR - Danish: - Bil DVR - Dutch: - Auto DVR - French: - Voiture DVR - German: - Auto DVR - Hebrew: - רכב DVR - Hindi: - कार DVR - Italian: - Auto DVR - Japanese: - 車 DVR - Korean: - 자동차 DVR - Malay: - Kereta DVR - Norwegian Bokmål: - Bil DVR - Romanian: - Auto DVR - Russian: - Автомобильный Видеорегистратор - Spanish: - Coche DVR - Thai: - กล้องติดรถยนต์ - Turkish: - Araba DVR - Vietnamese: - Xe DVR.